Fakro FTPV windows have been tested by Warrington Fire Research and achieve an SAA fire rating as well as meeting the standards set by the NHBC. 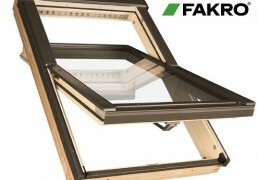 Fakro are the only roof windows to have achieved the BBA certificate in the UK. 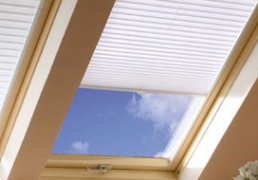 The structure of FAKRO roof windows ensure more light and enhanced illumination of any interior. By placing the air inlet in the top section of the window frame, FAKRO windows have a 6% larger glazed area than competitor products of the same size. In the winter, energy-efficient roof windows save heat, thanks to energy-efficient construction. The FTT Thermo U8 roof window with a coefficient Uw = 0.58 W/m2K, supplied and installed complete with EHV-AT Thermo flashing is the warmest window on the market. Fakro roof window protect the user against an unauthorised access and break in, making the environment safer for people working on the roof or living in a loft conversion. With a toughened glass and window structure reinforcement system,FAKRO roof windows achieve at least III class safety for the whole window, including glazing as per EN 13049. FAKRO was the first company to introduce a full range of windows with a minimum of III class safety, setting a new standard in the roof window sector. Fakro manufacture a wide range of accessories to complement their windows. From essential flashings fto ensure perfect installation of your roof window, to custom made blinds that provide the finishing touch, Caseys roofing can supply everything you need. The LMS Loft Ladder is a 3-section ladder where both the hatch and box are made of pine wood. The ladder itself is made of powder-coated metal RAL 7022. The hatch colour is beige, allowing it to be veneered or painted in any colour to match the interior design. 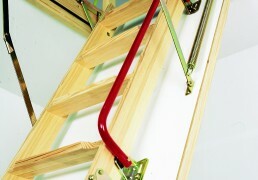 The LMK Loft Ladder unlike the LWM model, is equipped with a white hatch and red safety handrail. The safety handrail is attached to the ladder brackets and significantly increases ease of use of the ladder whilst decreasing the user’s risk of accident. Fakro offer various models of Loft Ladders, making it possible to satisfy the needs of each individual customer. All Fakro folding loft ladders ensure high tightness reducing heat loss of your loft and satisfy the requirements of EN 14975:2006. A popular Ladder within the range would be the LWS. However, with a slightly more generous budget to dispose of, the customer may choose the LWK model. The LWK comes with a white hatch, handrail and protective stile ends as standard. The Highly efficient LTK is available for customers who place emphasis on the lowest possible heat transmittance. Where a ladder cannot be unfolded, the LDK Sliding Loft Ladder can be used equipped similarly to LWK. Should the Loft Ladder be required to perform the role of a blaze and smoke block in the event of fire, both LWF and LSF Scissors Loft Ladders are available. An additional advantage to using the LSF is it’s quick installation and smaller opening dimensions. The LST Loft Ladder is a Scissors Loft Ladder equipped with a 3.6cm thick white insulated hatch as standard. The box structure is made of wood and features quick-installation brackets as standard. The hatch unloading mechanism supports the unit in any opening position in addition to when fully opened. This guarantees safe ladder folding and unfolding. Additionally, its structure eliminates the need for a lock. The ladder itself is powder-coated in grey RAL 7022. Overall floor-ceiling ladder height can be increased to a maximum 330cm by adding two LSS segments. The LSZ Loft Ladder structure is the same as the LST model except for the box structure which consists of a metal framework integrated with wooden box and quick installation bracket. The hatch unloading mechanism holds the unit in any position when fully opened, and this guarantees safe folding and unfolding the ladder. The unique special unloading mechanism eliminates the need for a lock. The overall floor-ceiling ladder height can be increased to a maximum 330cm by adding two LSS segments. The LSF Fire-Resistant Loft Ladder acts as a blaze block in case of fire inside the building preventing the smoke from entering the fire-free storey, thus providing additional precious time for the fire services to arrive in the event of emergency. The Loft Ladder fire-resistance is EI2 = 60 minutes. The overall floor-ceiling ladder height can be increased to a maximum 320cm by adding one LSS segment. An innovative, large roof window, in which the sashes create a functional balcony in the loft. The upper sash is opened steplessly upwards. The bottom sash tilts forwards to a vertical position, allowing free access to the balcony recess. It is enough to take a few steps in order to get “outside” and feel the warmth of the sun rays, refreshing breeze or admire beautiful views. The upper sash is opened steplessly upwards, up to an angle of 45°. The side rails are integrated into the bottom sash and extend during its opening. When the lower sash is closed, the balcony rails hide inside the window and are not visible above the roof surface. They are concealed under the window flashing, hence do not collect dirt or spoil aesthetic appearance of the roof. Both upper and bottom sashes are equipped with safe P2 glazing units as standard with laminated inner panes and toughened outer panes with easy maintenance coating. 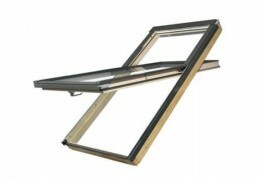 The window features a multi-point locking system, without a traditional locking assembly. After turning the handle, the sash is locked at two sides of the frame. Large sizes of the balcony window let plenty of natural light into the room. The window is equipped with an automatic air inlet V40P ensuring the optimum amount of fresh air in the room and energy savings. Balcony windows are available in size 94x255cm along with universal flashings. Installed in the roofs with pitches between 35º and 55º. Recommendation: installation in roof construction without L-shaped wall, in rooms with properly working ventilation. The centrally located pivot allows the sash to be opened in a range of positions allowing maximum amount of fresh air to be drawn into the room. The sash can also be pivoted 180 degrees and locked in place to allow safe and easy cleaning of the outer pane. The pivot allows the sash to be opened in a range of positions, thus increasing the amount of fresh air which can be drawn into the room. The Fakro centre pivot roof window is available in a variety of different sizes with the vast majority in stock for swift delivery. • Manufactured in pine, vacuum impregnated and coated with acrylic lacquer. • Handle positioned on the lower part of the sash for easy operation, and secured open in two positions. 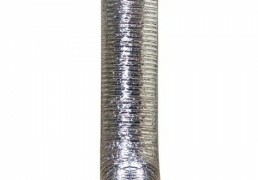 • Suitable for roofs with pitches between 15° and 90°. • FTP-V U3 – wooden window with superior air inlet V40P. The Fakro high pivot roof window (FYP-V) is similar to a standard centre pivot but as the axis of rotation is centred higher up in the frame, the lower part of the roof window opens wider thus allowing more air in. This Fakro skylight also protudes only slighlty into the room making banging your head less likely. It is currently the only window on the market which meets the conditions of DIN 5034-1 which relates to the the lower part of the window being 950mm above floor level and the upper part a minimum of 2200mm above floor level (when fitted between 39° – 43° on the roof) . 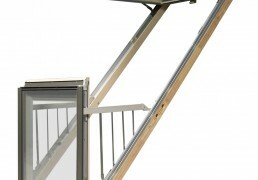 Between the angles of 0º- 45º this Fakro roof window is held by a support mechanism allowing the window to be open in any position within this range. The FYP-V Fakro high pivot roof window is also equipped with the automatic air inlet V40P supplying the optimum amount of fresh air into the room. The sash can be rotated through 160º and locked for washing with the use of a bolt. 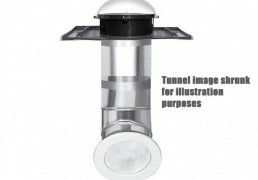 Suitable for roofs with pitches between 20° and 65°. 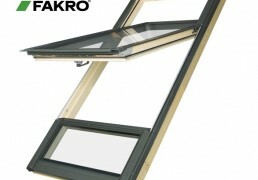 The Fakro high pivot duet roof window (FDY-V U3) is two windows in one to allow maximum of light into the room. The upper window is the Fakro High Pivot Window which is similar to a standard centre pivot but with the as the axis of rotation centred higher up in the frame. This allows a larger opening area meaning more air flowing into the room. The lower window is non opening and has a laminated outer pane. The FDY-V U3 Fakro duet high pivot roof window is also equipped with the automatic air inlet V40P supplying the optimum amount of fresh air into the room. FDY-V-U3 – wooden window with superior air inlet V40P<a id=”quote”></a>.